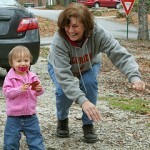 Grandma Plays with Emily: My mother, aunt and older brother are camping in Northern Georgia this week, so Rachelle planned a day trip to see them. Emily really enjoyed her day visiting with them. This entry was posted on April 1, 2008 at 6:15 am.